Fixed a critical bug with partial POV-Ray code parsing. Added some missing information to the manual. Added partial POV-Ray code to the materials. Now a material can use its basic properties plus any custom pigment, normal or finish written in POV-Ray code. Added a way of selecting several groups using their names. Useful for selecting body parts for subdivision. Changed the material preview scene to a UV mesh object. Fixed a bug where the colors in transparency mapping did not match the preview. The POV-Ray material generator now assembles the material using separately defined textures. Updated the quality selector in the POV-Ray tab to match the built-in quality value for POV-Ray. Moved the soft shadow and material trans mapping toggles to the scene options in the POV-Ray tab. Added a white material only for preview renders in the POV-Ray tab. Added a couple of new render presets. Added variable texture filtering as a multiplying factor with the base color. Added a few missing materials to the POV-Ray library. Also fixed some library errors. Pigments do not use POV-Ray built-in filtering anymore. It multiplies with the color only if it is non-white and the filtering is greater than zero. Now POV-Ray generated code only writes needed translations, rotations or scaling. Added a sky preview scene that shows a reflection and effect on a white only material. Decreased the default light density to 4x4 instead of 10x10. With high AA the difference is unoticeable. Moved the preview material button to the general material toolbar. 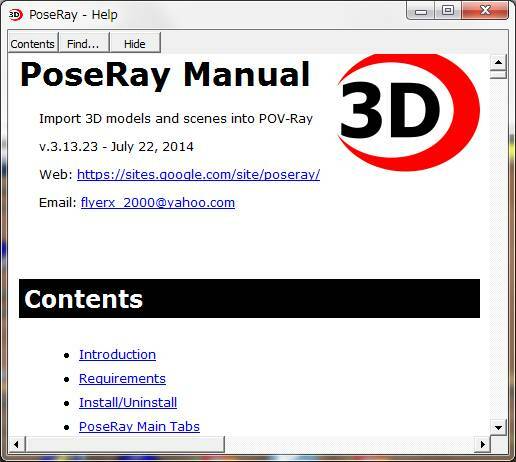 Now preview of basic materials does not require manually inserting code into POV-Ray material section. The library thumbnails use the entry's name for easier internal management. Removed the fake fresnel from the basic material. It was moved to the material library as a template. Moved overall pigment transparency to the pigment section as it is one of its properties. Transparency mapping still works as previously. Fixed a bug where the extents of the 3D scene in the preview window could become corrupted. Fixed the first material not being filtered when a Poser or DAZ Studio scene is imported. Default size of area lights is better scaled now. Added a material tool to operate on hair materials. It removes bump, specular and makes the hair render better in POV-Ray.